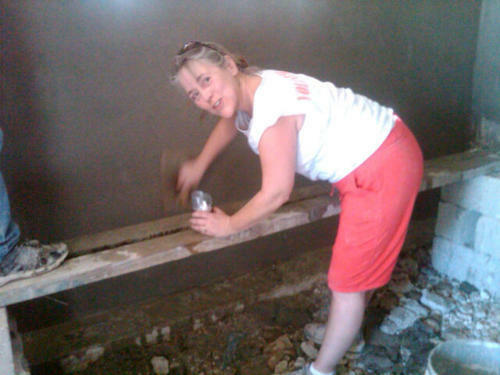 Robin got a lesson in skimcoating walls from the Haitian masons Gilbert and Deufaux on Friday morning. The clinic closed at midday to celebrate the New Year holiday, which is also the Haitian Independence Day, so our medical volunteers visited the construction site in the afternoon. Here, Jason, Amar and Sarit, assisted by Robin’s friend Junior, are storing sifted sand to be used for mortar. Amar worked w/ Nurse Bennet, treating two patients with abscessed infections. Medical supplies arrived just in time for the drainage procedures. Med school, here he comes. Thuy has been working w/ Dr. Sem, treating emergencies, diabetics, pregnant women and children for a variety of illnesses and prenatal care. The highlight for her was helping to deliver a baby on Tuesday. Brett and Christine have been volunteering in the lab at the clinic. They have been consulting with clinic staff about testing to be used here. Max, Allie, Megan, Ken and Robin have been sweating it out at the construction site. Work consists of sifting piles of gravel to make sand for mortar and then using the remaining stones to fill the floor holes. Max is convinced he has a Haitian twin, also named Max. Too much tropical sun for Max. We are lucky to have Martha here to keep us working and instruct us proper disposal of TP. She has a great heart for this work and love for the Haitian people. Weather is hot during the day and comfortable in the evening, which is cold by the Haitian standards. We are having a quiet New Year’s Eve in Haiti. We wish all of our loved ones at home a happy new year.